These days, Mindfulness training and practice is commonly integrated into elite training programs, often through the psychology or counselling services. The positive and beneficial effects of mindfulness practice are very well researched, with fascinating recent research by the neuroscience team at the University of Massachusetts which can be found here. The great news about mindfulness for Dietitians is that there are many possible applications of these practices to eating and the ways we interact with food. For athletes specifically, mindfulness is an approach which invites and guides athletes to approach fuelling a little differently. It does not ignore the many & varied nutritional demands of training and competition, but rather encourages athletes to useawareness and curiosity so that they learn to experiment, test their body’s responses and determine what works best for them whilst working alongside nutrition knowledge. In other words, mindful eating is about bringing together the ideas of outer wisdom (nutrition knowledge) & inner wisdom (what we know & understand about ourselves and our bodies). Mindful eating encourages athletes to use awareness & curiosity......to work out what works best for them. Develop a reflective and curious attitude to eating and fuelling, which reflects respect, care and consideration. As a Sports Dietitian, should you be practising mindfulness yourself if you want introduce mindful eating to your athletes? Absolutely. I’m not talking about sitting in lotus position for hours on end, or heading off to a silent retreat for a week (although if that floats your boat, by all means go for it!) but it’s essential that you are actively engaging in some sort of mindfulness practice yourself. If you’d like to find out more about how you can get started, or why I think Mindfulness is so important for all Dietitians, I’ve recorded a webinar which you’re welcome to take a look at on The Mindful Dietitian website. 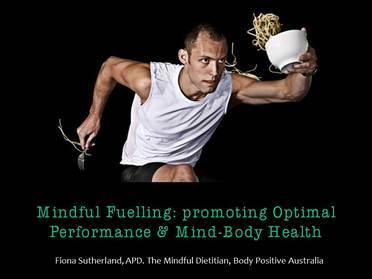 Mindful eating principles can be applied across all sports and are suitable for most athletes. When introduced appropriately, these practices can be a really valuable addition to any Sports Dietitians skill set and help us cultivate greater relationships with the athletes we are working with, as well as continuing to offer unique and innovative programs to our athletes. I can see it now….Sports Dietitians: Supporting you to fuel mindfully for optimal performance!